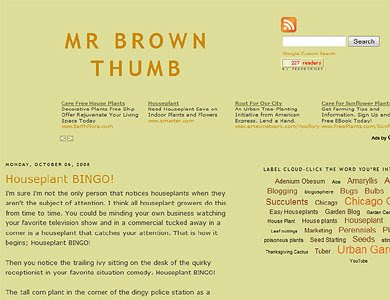 MrBrownThumb is a garden blogger from Chicago, IL. He picked up "gardening" a few years ago to help a family member cope with the loss of a loved one. The family member didn't show much interest in the memory garden created but it renewed his appreciation of plants. In the late 90s MrBrownThumb's plant interests were exclusively bonsai related. Today his plant interests span from outdoor gardening to growing Amaryllis bulbs. His garden blog reflects this diversity and covers, indoor gardening, outdoor gardening, plant propagation, garden photography and cacti & Succulents among other topics. In 2008 he founded www.GardenBloggers.com, a blog dedicated to covering garden bloggers and the mechanics of garden blogging.